Imagine… inhale the fresh balmy air of African Bushveld. Fall asleep to the gurgling of the river, interrupted by the eerie whoops of hyena, spine-chilling wails of jackals and the plaintive cry of the thicktailed bushbaby. Awaken to the melodious chorus of birdsong and watch the activity of wildlife drinking at the river or at our spotlit waterhole. Walk along the pristine banks of the perennial Klaserie River amongst huge Sycamore Figs and giant Matumi trees... this is Marc’s Treehouse Lodge. Accommodation at Marc’s is secure, comfortable and relaxed. We offer 12 treehouses : five original units built in the trees with designated private ablutions on the ground below and seven en suite units built on stilts within the tree canopy. Three treehouses overlook an illuminated waterhole, often frequented by our resident buffalo herd while nine treehouses are discreetly nestled in gallery forest along the river. 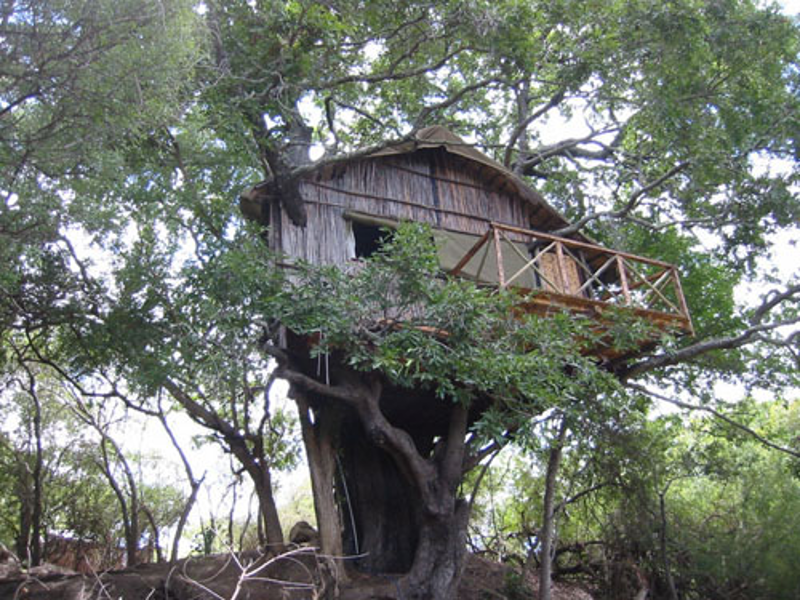 Each treehouse is equipped with beds and linen, soap and towels, overhead fan, mosquito nets and wooden viewing deck. In addition we have added two brick and mortar guest houses as well as two equipped canvas tents for those of our clients that prefer these types of accommodationMarc’s Treehouse Lodge has a swimming pool, an elevated library, bush bar and rustic boma where 3 course meals are served. After your evening meal, which always has a typical African flavour, you can relax around the crackling campfire and share your impressions of the day’s wildlife highlights and adventures. Compared to similarly priced camping safaris for backpackers, Marc’s offers so much more and it is easy to understand why it has become a favourite venue for the backpacking fraternity. DAY ONE : Pick up from your hostel or Johannesburg Airport and travel in an airconditioned vehicle via Dullstroom or Nelspruit to Tremisana Lodge. After a short break ( swim/ early Sundowner at the bar ) you board the open Landcruiser for a 3 hour sunset drive. Your qualified guide will facilitate your first sightings of Africa's varied fauna. We stop for photos of the magnificent African sunset. After dark, your guide will use a powerful spotlight to locate nocturnal animals. We drive to the beautiful Marula Tree Boma where a ranger awaits you. Around a crackling fire, he expertly prepares your meat. After dinner continue with the night drive and arrive at TREMISANA LODGE where you will be accommodated in an air conditioned en suite chalet. DAY TWO : After breakfast we board our open Gameviewer that provides unbeatable opportunities for a total sensual wildlife experience. These vehicles offer superior viewing and the absence of windows allows you to hear and smell the African bush and its denizens. Your experienced guide will show you many animals and birds that frequent this wildlife paradise. The Orpen/ Satara region has open plains with numerous herds of giraffe, zebra and antelope that attract the big cats. Dinner and overnight in your fascinating treehouse at Marc’s Treehouse Lodge. DAY THREE : Early morning game walk accompanied by your armed ranger. You will attempt to get close to the numerous animals that have made their home at Marc’s, especially nyala, buffalo and rhino. After breakfast, you drive via the Blyde River Canyon on your return to Johannesburg where you arrive in the late afternoon. Airport dropoff by arrangement. DAY ONE : We collect our clients from all hotels and guesthouses in Gauteng as well as from Johannesburg Airport. We travel via farmlands to the picturesque Lowveld and on to Tremisana Game Lodge in the Balule Section of the Kruger Park. After a short break, during which you may unwind at the bar, have a swim or relax in the tropical gardens, we board the open Landcruiser for a 3h Sunset Drive. Your guide will show you various animals and birds and after darkness falls, we use spotlights to locate nocturnal species. Dinner will be an unforgettable BUSH BRAAI at the amazing Marula Tree Boma. Overnight in comfortable air-conditioned en suite thatch-roofed chalets at Tremisana. DAY THREE : We travel to the Kruger Park where we board our open Gameviewer. The absence of windows and elevated vantage position allow for excellent photographic opportunities. You will have an amazing chance not only to view game but also to listen to and smell the African bush and its denizens. There will be regular stops at picnic spots and rest camps. Your experienced ranger will show you many animals and birds that frequent this wildlife paradise. The Orpen-Satara region boasts open plains and supports large herds of zebra, giraffe and antelope that attract numerous predators. In fact the zones we visit have the highest concentration of lions in Africa ! DAY ONE : Pick up from your hostel in Johannesburg or Pretoria or O R Tambo airport and drive to Tremisana Game Lodge in the Balule Section of Kruger. There is time for a rest in your air-conditioned chalet or a swim or a drink at the bar. Board our open Landcruiser for a 3h game drive on Balule Plains. After stopping to watch the magnificent African sunset, we use spotlights to identify nocturnal species. Dinner is a Bush Braai at Marula Tree Boma and overnight at Tremisana Lodge. DAY TWO : Awaken before sunrise for a cuppa and rusks. We drive to the Olifants River where our armed ranger conducts a 4h Big Five Game Walk. Adrenalin rushes will be acute, notwithstanding the presence of your armed field guide. Return to Tremisana for Brunch. At around 14h30 we enjoy a 2hr game drive on the open Landcruiser. Transfer to Marc’s Treehouse Lodge where accommodation is reserved in a charming and fascinating treehouse. Dinner and overnight at Marc’s Treehouse Lodge. DAY THREE : Full day on an open Gameviewer in Kruger Park. Your ranger will attempt to show you all of the Big Five. The area we visit has excellent visibility of open plains, home to numerous herds of zebra, giraffe, wildebeest and other antelope, that attract many lions. Elephant, buffalo and rhino are also abundant. DAY FOUR : After breakfast, we travel to the Moholoholo Rehabilitation Centre for injured and orphaned animals and birds. You will have an opportunity to get close and personal to some of the residents, including lions and leopards. After lunch, you drive to Tremisana. At around 15h00 we drive to TSHUKUDU GAME LODGE. After High Tea, we enjoy a 3 hour game drive in the Big Five Tshukudu Game Reserve. DAY FIVE : Early morning game walk accompanied by an armed ranger who will show you spoor and droppings of animals big and small. The walk concentrates on plants, birds and insects that are not normally appreciated from a vehicle. From time to time, dangerous animals such as Buffalo, Black Rhino and Leopard are encountered. After breakfast, we drive via the Three Rondawels of the Blyde River Canyon en route to Johannesburg where we arrive in the late afternoon. Airport drop off by arrangement. As per the FIVE DAY SAFARI above, with an additional day spent game viewing in the Kruger Park. Interested in Tree House Lodges?